Yukawa Y. 1992. A Classified Vocabulary of the Luba Language. Yukawa Y. 1989. A classified vocabulary of the Nilamba language. Buck C D. 1949. A dictionary of selected synonyms in the principal Indo-European languages. :1515. Samarin WJ. 1967. Field linguistics: A guide to linguistic field work. Summers D. 1993. Longman language activator: the world's first production dictionary. Svelmoe G, Svelmoe T. Submitted. Mansaka dictionary. Murdock GP. 1982. Outline of cultural materials. Trappes-Lomax H. 1997. Oxford learner's wordfinder dictionary. Smith KD. 2000. Sedang dictionary. Roget P. 1989. Top Pocket Roget's Thesaurus of English Words and Phrases. Longman Top Pocket Series. :640. Guo D. 1994. Xiandai Hanyu dongci fenlei cidian. Fleming I. 1988. Communication analysis: A stratificational approach. Dallas: Summer Institute of Linguistics. Yukawa Y. 1979. A tentative questionnaire for the words of Bantu languages. Journal of Asian and African Studies. 17:139–212. Premsrirat S. 2002. Thesaurus and Dictionary Series of Khmu dialects in Southeast Asia. Mon-Khmer Studies-Mahidol University Special Publications. Lukula AM. 1991. The nature and extent of linguistic change among insular Jita in Ukerewe. Moe R. 2001. Gikuyu semantic domain list. Neville T. 1985. Kalinga dictionary. Van Otterloo R, Van Otterloo K. 2000. Kifuliiru Dictionary. Naden T. 0. 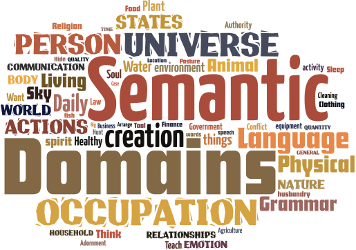 List of semantic domains. Moe R. 2002. Lugwere semantic domain list. Batibo HM. 1989. Questionnaire on cultural vocabulary. Snider K, Roberts J. 2002. SIL comparative African word list. Hohulin L. 1994. Tuwali Ifugao dictionary. de Blois R. In Press. Semantic Dictionary of Biblical Hebrew.